Since January, Wednesdays have been a special day in Ella's life. They have been "ballet days." I LOVE Ella's ballet school. Miss Christine, the studio owner and Ella's teacher, is a wonderful French woman who offers caring yet firm instruction. I'm so glad that we've been able to give her lessons this year. 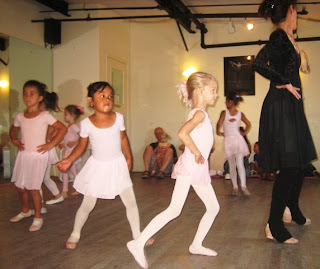 The studio doesn't have a recital for the youngest dancers...and that is just fine by me. Given Ella's past performance anxiety issues, I'm not in a hurry to get her on a stage in front of hundreds of people. Instead, the studio offers an "Open House" on the last day of the session. The dancers have a normal class and we parents get to watch. I was so proud of Ella. She performed beautifully...and managed not to talk to her best friend Vera too much. 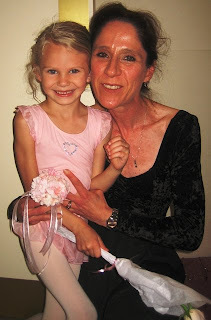 I even got to see her "arabesque" which is her favorite part of ballet. 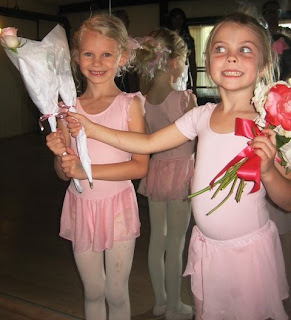 At the end of class, Miss Christine gave each girl a beautiful pale pink rose. Ella was so excited to have her very own flower...and to pose for pictures with Vera. I hope to get to watch my Ella enjoy ballet for many years to come.